Maybe the kid was in a hurry to get inside to use the bathroom and he didn’t bother with the kickstand. @ JR: Turn to your right and youll see him! There is a man across the street (in front of the pink house) watching it all go down. that’s great, are there any more examples of things being caught by these cars, i’ve seen an alleged deal caught on camera by them, but there must be more! That’s the same kid who’ll call you a clueless old man in a few years, so good. 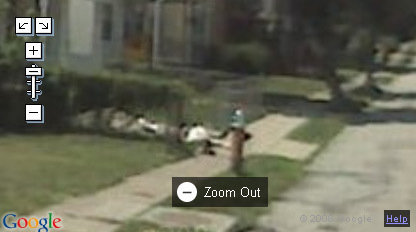 Wow nice find, the guy across the street is also checking out the kids spill! you gotta love google. i hope they do this to our maps in australia. funny photo tho. Looks like he broke his legs. Have to admit, kid did a good job ! It’s broken, can anyone submit a screenshot? Some screen captures have been added now. 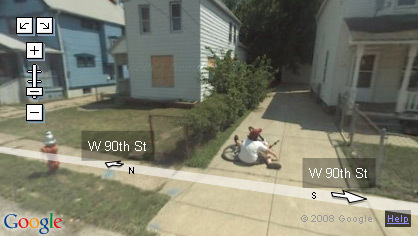 google map has caught some people doing funny things . like my buddy how was caught at his house when he was sopposed to be delivering part. :p lunsford , salinas ,ca lol busted!!! !